The deputy general of Biscay has attended this morning to the breakthrough of the second tunnel of Urdinbide and has revealed that last September 24th it was carried out the first of the limes. Unai Rementeria has confirmed that the work is running just as it was planned. Rementeria wished that this work, which will save the high of Autzagane through the tunnels of Urdinbide, achieve its goal of improving safety on the road network of the territory as well as the connection and quality of life of Biscay. “We have managed to avoid that 1,500 vehi?cles pass daily through the center of Amorebieta-Etxano. This investment will be welcome if it avoids traffic accidents and improves the connection and the quality of life of the Biscayne people”, said the Deputy General. ?This summer has also finished the improvement works in the high of Autzagane and the curves of Gorozika to make the road safer while finalizing the work of the tunnels. This improvement project was included in the Bidesarea plan.?? The Tunnel of Urdinbide saves the high of Autzagane, which connects the towns of Amorebieta-Etxano and Muxika, with an almost straight path, which begins near the entrance to the Biribieta neighborhood, and ends before the link to Gorozika neighborhood. ?The northern tip of the tunnel is within the Urdaibai estuary.?? Urdinbide´s tunnel is a twin tube (a tube through road) and two lanes in each direction. The separation between the two axes is about 21,50 m. This separation remains substantially constant along the entire length of the mine tunnel.?? The total length of the tunnels is somewhat less than 700 m per tube (695 and 693 m, respectively in the 1 and 2 axis) with maximum coatings of around 90 m, with the share of the mine tunnel of 538 and 537 meters respectively for each axis. It presents a false tunnel entrance from the southern entrance of 112 meters and another false exit of the tunnel from the north mouth of 45 and 44 meters respectively.?? On October 6th, 2016, the state of the works is as follows:?? 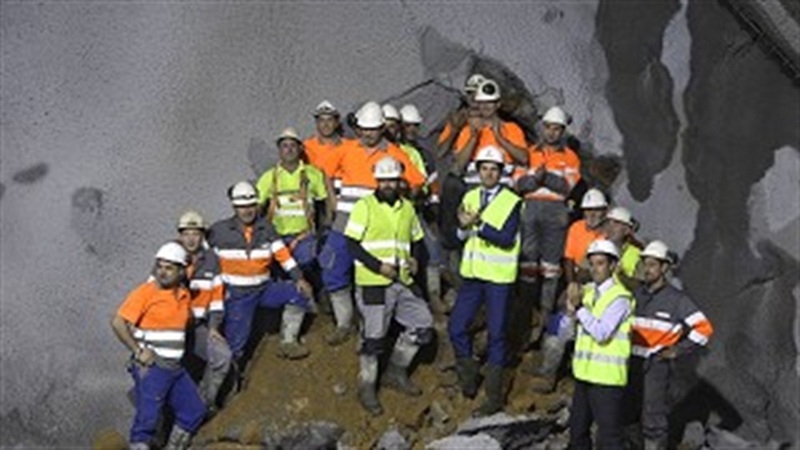 • With the breakthrough of the axis 2, which today has been carried out, the excavation is completed in advance of the two axes of the tunnel, as in the other tube (axis 1) the breakthrough occurred last September 24th. It must be noted that this breakthrough occurred on the date specified in the contractual plan approved at the beginning of the works. ?The breakthrough of the tunnel is a major milestone because, in addition to allowing the transit between the two mouths and reduce the need for forced ventilation by generating a natural draft, it is the completion of the waterproofing treatments and improved injections in the top part of the tunnel (vault); pending the treatment in the collapse phase, which are minor, and that in addition to comprise fewer holes, they are performed on material pretreated in the advance phase.?? • As for the excavation phase in shatters, they have been made to the current date 5 out of 44 (22 per axis) processing sections provided in the proposed termination involving approximately 10% of the total to be treated. The completion, of this stage, the waterproofing and excavation treatments is scheduled on April 2017.?? • It is also already run the 100% of the false tunnels and the 48% of the coating of the concrete, although these actions were carried out by the previous contractor. ?After the excavation will take place, we continue with the execution of the invert, which no longer requires injections, and subsequently, the concrete lining. Finally, the pipes, sidewalks, firm and tunnel installations will be carried out.